In this painting, Nicolaes Maes almost exactly copied Albrecht Dürer's 1504 engraving of the Nativity. 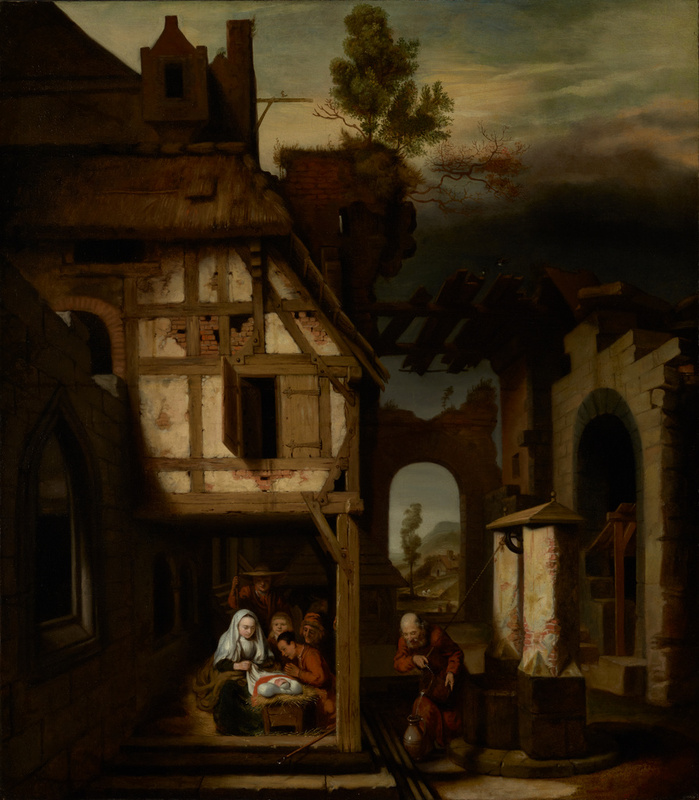 Maes simply widened the house to the left, provided new poses for the Virgin Mary and baby Jesus, and added the four shepherds that give the painting its new subject. The harmony of blacks, browns, and whites that he chose emphasizes the painting's print origin. He successfully used the fluid medium of oil paint to render such textures as the stable's wooden door, the exposed bricks, and the thatched roof. Source: sale cat., Christie's, London, July 5, 1920, lot 83; picture does not appear in any of the Delaroff sale catalogues. H. Shickman Gallery (New York, New York), sold to the J. Paul Getty Museum, 1970. Phillips, London. Splendid Italian Pictures: A Catalogue of the Highly Valuable and Splendid Pictures, of the Italian, Venetian & Flemish Schools, the Property of R. Westall, Esq. R.A. [...]. May 14, 1830, pp. 16-17, lot 76 (possibly Getty painting). Phillips, Cheltenham. Catalogue of the Late Lord Northwick's Extensive and Magnificent Collection of Ancient and Modern Pictures [...] at Thirlestane House, Cheltenham. July 26, 1859, p. 168, lot 1866 (possibly Getty painting). Hofstede de Groot, Cornelis. A Catalogue Raisonné of the Works of the Most Eminent Dutch Painters of the Seventeenth Century, Based on the Works of John Smith. Edward G. Hawke, ed. and trans. (London: Macmillan and Co., 1908-27), vol. 6 (1916), p. 480, no. 5a. Christie, Manson & Woods, London. Catalogue of Old Pictures from Various Sources. July 5, 1920, p. 11, lot 83. Fredericksen, Burton B. Catalogue of the Paintings in the J. Paul Getty Museum (Malibu: J. Paul Getty Museum, 1972), p. 83, no. 108, ill.
Fredericksen, Burton B., ed. The J. Paul Getty Museum: Greek and Roman Antiquities, Western European Paintings, French Decorative Arts of the Eighteenth Century (Malibu: J. Paul Getty Museum, 1975), p. 122, ill.
Fredericksen, Burton B., et al. Guidebook: The J. Paul Getty Museum. 3rd ed. (Malibu: J. Paul Getty Museum, 1976), p. 56. Fredericksen, Burton B., Jiří Frel, and Gillian Wilson. Guidebook: The J. Paul Getty Museum. 4th ed. Sandra Morgan, ed. (Malibu: J. Paul Getty Museum, 1978), p. 71. Fredericksen, Burton B., Jiří Frel, and Gillian Wilson. The J. Paul Getty Museum Guidebook. 5th ed. (Malibu: J. Paul Getty Museum, 1980), p. 55. Robinson, William. "'The Sacrifice of Isaac': An Unpublished Painting by Nicolaes Maes." The Burlington Magazine 126, no. 978 (September 1984), p. 540. Sutton, Peter C. A Guide to Dutch Art in America (Grand Rapids: Wm. B. Eerdmans, 1986), p. 141. Jaffé, David. Summary Catalogue of European Paintings in the J. Paul Getty Museum (Los Angeles: J. Paul Getty Museum, 1997), p. 77, ill.
Krempel, León. Studien zu den datierten Gemälden des Nicolaes Maes (1643-1693) (Petersberg: Michael Imhof Verlag, 2000), pp. 46, 48, 69, 147, 359, no. D26, pl. 4, fig. 32; p. 288, under no. A31. Blanc, Jan. "La peinture d'architecture et de perspective dans la Hollande du XVIIe siècle." Perspective: La revue de l'INHA 2 (2006), p. 337.